DEFY Composite Deck Waterproofing Sealer can be applied to all natural and composite wood surfaces. DEFY Composite Deck Waterproofing Sealer contains zinc nano-particles that reflect the damaging Ultraviolet Rays from the sun. When you reduce the size of these zinc particles down to the nano level, they become invisible to the naked eye. These nano-particles are distributed at a rate of over 30 trillion per square inch of surface area to provide protection from the sun in much the same way as they do when used in sun blockers and sunscreen lotions. Not only will this help with prolonging the graying, but the nano-particles are highly resistant to mold and mildew, enabling you to retain the natural color. 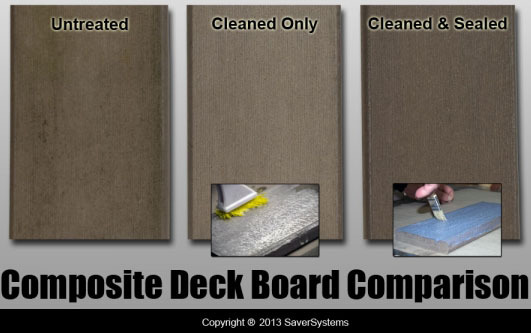 DEFY Composite Deck Waterproofing Sealer is available in a crystal clear finish. 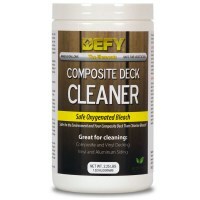 Before using DEFY Composite Deck Waterproofing Sealer, clean the deck with DEFY Composite Deck Cleaner. This will generally clean and restore previously treated surfaces to their original appearance. The surface should be recoated when graying initially starts to appear. How often should you reapply? As needed. Every couple of years is normal but it does vary based on your environment. I applied your Deck Sealer on my Trex deck three years ago and have been very happy with the result. I am now thinking it is time to re-coat. Should I simply follow the instructions for cleaning and sealing or should I do anything different given that this is a re-coat? Sorry, the sealer cannot be tinted not do we make a stain for a composite deck, just the sealer. We have a ChoiceDek deck. Will Defy sealer penetrate this material so as not to create a film that will peel? This will work on all composite decking. 1. Is Defy Sealer designed be applied to the floor of a deck made of pressure treated pine, with cracks? 2. If so, is it a good idea to prep the floor boards with Deck stripper and brightener before applying the Deck sealer? 3. Do you recommend applying a Defy stain over a deck that has been treated with Defy sealer? 4. Any other caveats and suggestions would be appreciated. 1. This is a composite sealer for composite wood. If you have a PTP deck, you would want the Defy Extreme Stain. 2. You always have to prep first. 3. You cannot apply a sealer over a deck stain or vice versa. 4. You do not need both a sealer and a stain. Just the stain. I just painted my composite deck with Arborcoat Deck Paint, and I want to seal it. Will this product with over top of the Arborcoat Deck Paint? It was made to work with composite decks. This will not work over a paint.